If love had a way, it would have ruled the earth and made paradise right here. 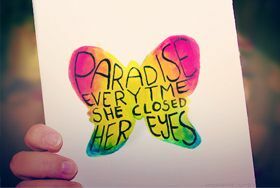 If paradise is made of love and beauty, then you are my paradise. I know paradise has many gates, just as hell does. One has to learn to distinguish between them, or one is lost. Paradise is heaven and is described by those who have not seen it and those who have seen do not come back to earth to describe it. Hence paradise is envisioned only in the books and in our dreams. But it is possible to see paradise- like situation in the earth only if we correct our mistakes and lead a hassle free life. “All paradises, all utopias are designed by who is not there and by the people who are not allowed in” said Toni Morrison. To create a paradise on earth, we should make sincere efforts in developing good characters and deeds. “The academy is not paradise but learning is a place where paradise can be created” said, Bell Hooks. There is no other greater thing than patience which is the key to paradise. Our patience will be rewarded one day or other, though it would take a long time. Here are quotes on paradise read them and enjoy.